There are cards labeled 1, 2, ..., . Initially, the cards are randomly divided between two players, A and B. For example, if is even, each player could get half of the cards. At each move of the game, one of the numbers from 1 to is chosen at random and the player with this card must give it to the other player. The game continues until one of the player has all the cards. 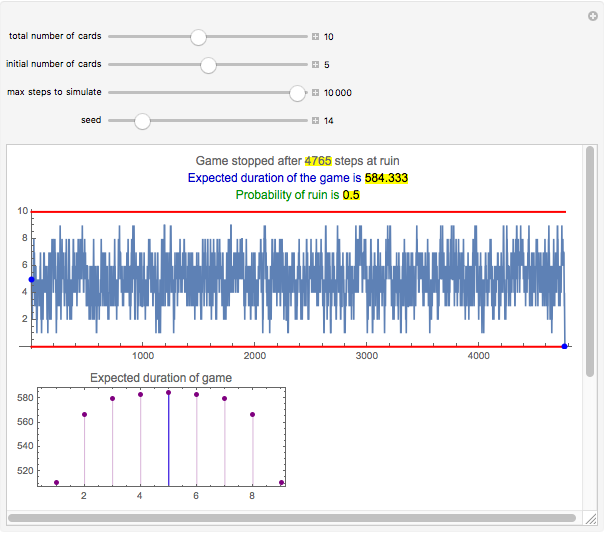 This Demonstration shows games for one of the players, with expected duration and probability of ruin. This process is a discrete-time Markov chain with two absorbing barriers. The corresponding walk is said to be reluctant because the process hesitates before stopping. Indeed, the more the walker approaches one of the absorbing barriers, the lower the probability becomes that the next move is toward this barrier. 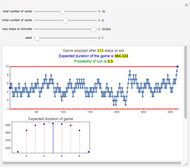 The result is that the game lasts a long time on average. Snapshot 1: There are 10 cards and initially player A has five cards. The game lasted 313 steps and player A won the game. In this example, the expected duration is approximately 584 steps. The lower-left plot shows that the duration does not depend much on the initial number of cards; this is the result of the random walk having the tendency to move away from the absorbing barriers. Even with one or nine cards, the expected duration is only somewhat smaller, 511. Similarly, the probability of ruin does not depend much on the initial number of cards and is quite near to 0.5 for all initial numbers of cards. Only the case of having initially one or nine cards has a somewhat larger effect to the probability of ruin. Snapshot 2: The initial situation is as in the first snapshot. However, now the game lasted the minimum number of steps, five. Snapshot 3: Again this starts as in snapshot 1, but the game lasted 4765 steps! 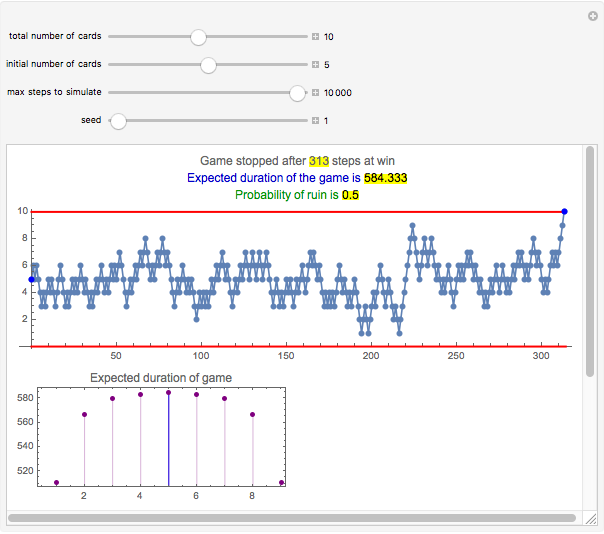 Snapshot 4: With only six cards, the expected duration of the game is 37. Snapshot 5: With 20 cards, the expected duration of the game is over a half-million steps! The discrete-time Markov chain is as follows. The walker A moves among the points 0, 1, 2, …, . The chain is said to be currently in state if player A has cards. The walker moves from state to state with probability and to state with probability . States 0 and are absorbing, so that the chain remains in state 0 or once it is achieved. For example, the walker moves from state 1 to state 0 or from state to state only with probability . This implies that the walker hesitates to stop. 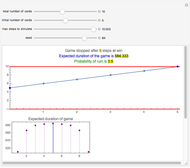 Consider the expected duration of the game. Let be the expected duration if player A initially has cards. After the first step, A has either cards with probability or cards with probability . Thus, by the theorem of total expectation, . This recurrence equation can be solved for in terms of and . Clearly, the initial condition is . It can be shown  that . Consider then the probability of ruin. Let be the probability of ruin if player A initially has cards. 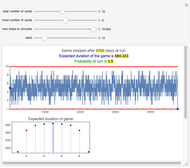 By the theorem of total probability, . This equation can be solved for in terms of and . As to initial conditions, clearly . It can be shown  that . The reluctant random walk can be compared with the so-called gambler's ruin process; see The Gambler's Ruin. Assume, for example, that player A initially has five dollars and that the casino also has five dollars. 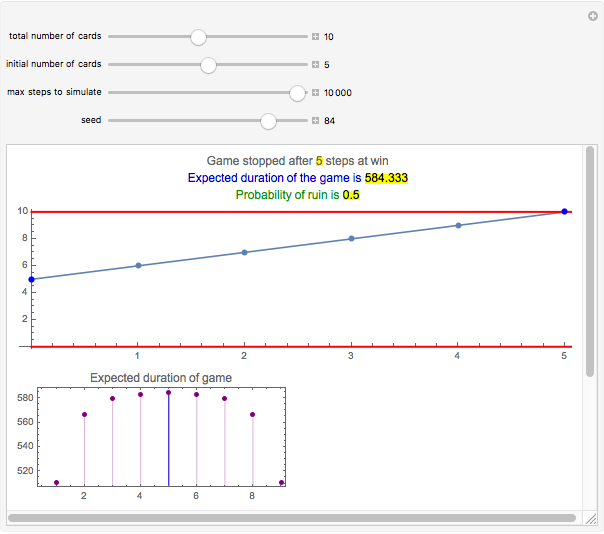 At each step, player A wins or loses one dollar with probability 0.5. The game stops once A has 0 or 10 dollars. The expected duration of this game is only 25. Recall that in the reluctant random walk the corresponding expected duration was 584. This Demonstration is based on [1, pp. 34–37]. Heikki Ruskeepää "A Reluctant Random Walk"